​​​SAN ANTONIO - Homes being built nowadays in San Antonio are about twice as large as a century ago, and are some of the largest in the nation. Pulling in data for properties across 32 of the largest and busiest U.S. cities, PropertyShark compared local trends with the evolution in size of the average American home to see whether urban living does indeed mean sacrificing larger living spaces. The average size of homes (houses, condos and co-ops), has gone up significantly across America. U.S.-wide homes built in the last six years are now larger by 74 percent and spread over 2,430 sf. San Antonio is one of only four cities to surpass the national average, boasting an average home size of 2,947 sf, the second largest city average in the nation. 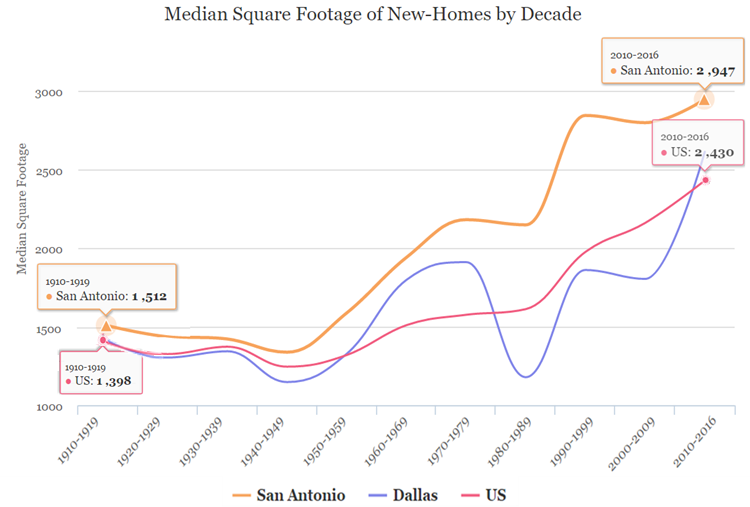 The Southwest and Texas saw the highest increases, as regular homes turned into mansions.